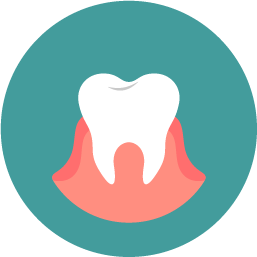 There are two types of periodontal (gum) disease: gingivitis and periodontitis. Gingivitis is the mildest form of periodontitis. Gingivitis usually is the result of poor oral hygiene. It causes red, swollen gums that bleed easily. The upside to a case of gingivitis is that with professional care and good oral hygiene, it can be reversed. Periodontitis is a chronic bacterial infection that affects the gums and bone surrounding the teeth. It is caused from an aggressive immune system response to the microorganisms that grow and adhere to your teeth below the gum line. Plaque and bacteria that have grown below the gums release toxins, causing inflammation. In return, the body activates the chronic inflammatory response, which basically means the body turns on itself. As this takes place, the tissues surrounding the teeth, gums and bone are destroyed. The gums begin to pull away from the tooth, creating a "pocket" that becomes infected. Think of a turtleneck sweater, the sweater being your gums and the neck your tooth. A healthy mouth has tight little turtlenecks around each tooth. A mouth suffering from peridontitis has loose, ill-fitting turtlenecks around the teeth. The area between the tooth and the loose turtleneck is the infected gum pocket. If left untreated the disease process will continue. More and more gum tissue and bone will be destroyed and lost, which can lead to tooth loss. Periodontitis is the number one cause of tooth loss in adults over the age of 35. Often, this disease has very mild to no symptoms. This is why it is crucial to visit us on a regular basis. The only way to diagnose periodontitis is through an exam where we measure the depth of the gum pockets and review bone levels on radiographs. Unfortunately, once tissue and bone have been lost as a result of periodontitis, it is lost for good. Periodontitis is different from gingivitis in that it is irreversible. However, there are treatment options depending on the severity of the disease. Scaling and root planing is a non-surgical periodontal therapy option. Scaling is the removal of calculus and bacteria from the tooth and root surface. Root planing smooths the root surfaces, making it more difficult for the plaque, calculus and microorganisms to adhere. In doing this we hope to rid the deep gum pocket of infection, allowing the gum to reattach and causing the pocket to become healthy and shallower. If the disease is advanced, and scaling and root planing won't cut it, there are surgical options. Once you have been diagnosed with periodontitis, Dr. Seneczko will determine the severity of the disease. Many cases can be treated right here in our office with the non-surgical treatment option, scaling and root planing. If further extensive treatment is needed, we will refer you to one of our great periodontists in the area.